1. 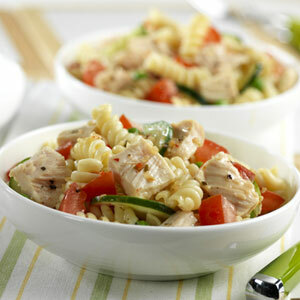 In a large bowl, combine pasta, onion, sweet red pepper, corn, chillies, jalapenos, and cilantro. 2. Add chicken pices to pasta mixture. 3. In a small bowl, whisk together mayonnaise, chilli powder, and cumin. Pour over pasta and mix well. 4. Chill at least 30 minutes to blend flavors.